Everyone needs a place to sleep. A journalist needs several, due to the nomadic nature of the profession. The success of a journalist therefore relies on his/hers ability to find places to sleep, either by exploiting people’s good will or good old “persuasion”. 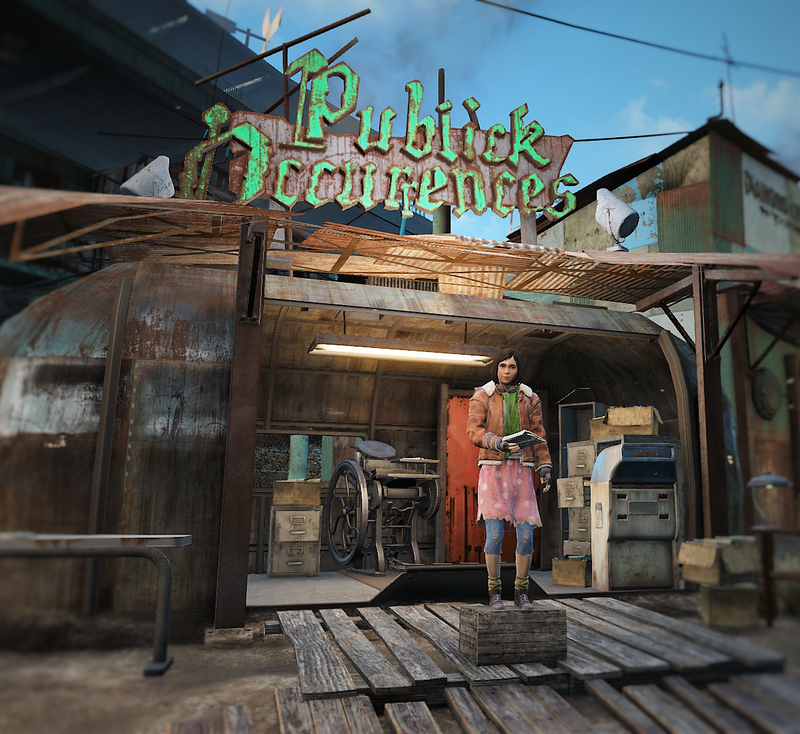 I have arrived at Diamond City, arguably the busiest place in the Commonwealth. A vibrant city, relatively, full of people and thriving commerce, again relative in post-apocalyptic terms. Upon arrival I met a young girl giving out free newspapers for the news agency “Public Occurences”. After a mandatory talk about subjects regarding our profession, I appealed to her journalistic integrity and managed to get a place to sleep for a few days. A temporary safe haven from the self-destructive chaos in the wasteland will be just great, I thought. Independent, free press. Liberty in it’s purest form. She told me to make myself some coffee inside while she handed out the rest of the newspapers. Well inside, making my self a cup of coffee on a provisional hot plate, something unfortunate happened. I’m not sure what caused the whole thing, but fortunately I was there to document it. Out of nowhere, a bunch of papers next to the coffee table with the hot plate on it, spontaneously lit on fire and spread towards the printing press. Next to it was a gasoline tank. Given a high enough temperature, these things expand, fast and explosion-y. Milliseconds later the printing press was cloaked in burning gasoline. Safe to say, I was thrown out, despite my best efforts to plead my (partial) innosense. The girl yelled something about me being a fascist and against the free press and some other non-flattering characteristics. I’m off to finding a new place to crash. Click here to see the next article in the series.